If you still feel sticky after a shower, your skin becomes irritable and red or your hair gets brittle without volume, then time has come for you to install a shower head water filter. Shower head water filters are capable of preventing your hair from breaking and being discolored, keep your skin soft and supple and give you that squeaky-clean, refreshing feeling by eliminating impurities and chemicals in your water supply. In this article, we will take a look at some of the best shower head water filters you can buy, depending on your needs. Also, we have included a guide to help you make the buying process easy and decisive. What Is A Shower Head Water Filter? In a nutshell, shower head water filters are compact devices that can be attached to your shower to make the water cleaner and healthier. These units direct water through various mediums that remove various contaminants mechanically or chemically. These filters normally direct water through a series of 10-12 different carbon mediums to remove most of the commonly found impurities. The first step is mechanical and employs the use of tightly woven cotton. The cotton is made tight enough for particles larger than 0.1 – 0.3 microns to get trapped. This carbon arrangement is capable of eliminating most of the fragments, sediment and rust. After the removal of large suspensions, the next step is employed to soften the water. Using ion exchange resins, calcium and magnesium atoms will be eliminated, turning the water from hard to soft. At this stage, the water is directed through an activated carbon filter. Activated carbon blocks a lot of chemicals, including organic compounds such as algae, mold and fungi as well as harsh chemicals such as chlorine, and chloramine. Additional steps are normally incorporated for the removal of the remaining chlorine, toxins and bacteria in the water. KDF filters are made from a special mix of zinc and copper. These metals naturally oppose each other, thereby forming a weak electro-chemical charge that goes unnoticed by humans. Nonetheless, this charge affects the various elements dissolved in shower water such as chlorine, changing their structure and making them harmless. Besides chlorine, KDF technology is effective in getting rid of heavy metals. This technology was developed to replace silver, which was normally used in filters to kill bacteria and other germs. However, besides being expensive, silver is poisonous in large quantities and the risk of leakages was too much. KDF forms a safe and effective alternative. Vitamin C filters have consistently grown in popularity as one of the most effective chlorine removal systems when hooked to a shower. Some filter models with this technology boast of the ability to remove up to 99.9% of chlorine. These filters will also remove chloramine, but nothing much besides these two chemicals that exist in heavy amounts in tap water. They are fitted with tubes of vitamin C to eliminate impurities as well as make the water healthier by infusing it with the essential vitamin. Who Needs A Shower Head Filter? While this may seem obvious at first, answering this question will simplify the buying process and help you narrow down on the wide range of options available in the market. For water that has a bad smell, there are shower head models that remove elements such as sulfur and iron sulfide which are normally the culprits behind such smells. In this regard, some filters are better than others at the job, with some models incorporating the option of aromatherapy. To filter discolored water that stains tubs or tiles, you will want a shower filter that can remove rust, heavy metals and general scale build-up. Furthermore, you may want to consider a shower filter that is easy to take apart for easy cleaning and filter replacement since these units are known to clog fast. If you live in a place where water is hard and thereby affects the health of your hair and skin, the best option is to go for a filter that cleans the water and also softens it. Not all filter units can handle this. You can also for water filters designed to specifically remove the compounds that make water hard such as chlorine and heavy metals. In case you want to purchase a shower head filter due to health issues, it will depend solely on the type of problem you want to improve. For instance, if you want to get rid of dry and flaky skin, go for filters that focus on removing harmful chemicals such as fluoride from water. Apart from improving the health of your hair and skin, shower head filter can also improve the health of your lungs. This is ideal for those with respiratory issues such as asthma. There are shower models built to remove breathable impurities such as vaporized chlorine. In order to make water fit for drinking, utility companies normally add chlorine to the water supply. Nonetheless, water treated with chlorine comes with its own set of problems. Chlorine causes the skin to dry and flake and makes hair brittle with less volume. Furthermore, during a hot shower, the chlorine in the water is vaporized and the substance finds its way into our bodies via skin pores and through the lungs. Continuous exposure to chlorine can lead to health issues, including respiratory problems, skin conditions such as eczema, acne and psoriasis. The AquaBliss SF220 shower filter is a powerful filtration system that purifies your water at whatever temperature using multiple stages. It is designed to remove chlorine, fluoride and other harmful chemicals that make water hard and harsh to the skin and hair. The AquaBliss SF220 also inhibits the growth of organic substances such as bacteria and fungi. After installing this shower system at home, you can expect your water to start feeling softer and gentler to both hair and skin in as little as a week. If there were any odors of chlorine, iron or sulfur in your water, you can expect them to disappear too. The multi-stage filtration system employs a unique combination of KDF-55, calcium sulfite and active carbon technologies to filter the water. The KDF-55 is the main reason why the AquaBliss SF220 is capable of filtering your water even at high temperatures. The activated carbon is the one responsible for removing chlorine and other impurities at lower temperatures. Lastly, the calcium sulfite is known to remove chlorine and other water impurities in both cold and hot water. What you get is a fine water filtration system that dramatically improved the condition of your skin, hair and nails. What’s more, this shower head is easy for even the least handy person to install. All you need to do is unscrew the existing shower head and screw the SF220 in its place – you will need no tools. It is also compatible with all the standard hand-held showers. After installation, you will notice that this shower head does not affect the pressure at all, and the components making up the system are sturdy. If you are planning to use your filter with well water, make sure to turn around the internal filter cartridge every month. Since well water normally tend to have high quantities of sediments, this will prevent the sediments from accumulating inside and blocking the water flow. Removes impurities in hot and cold water. Multistage filtration system works efficiently. Filter lasts up to 8 months. Some buyers have complained of low water pressure. This 15-stage shower head set from AquaHomeGroup is one of the best out there for turning hard water soft and making your showers enjoyable. 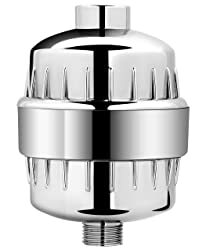 The shower head is made of a high-quality metallic body which houses an internal filter cartridge that contains vitamin C and E.
The system is fitted with alkaline ceramic balls, KDF-55, activated carbon and calcium sulfite to form a 15-step water filtration system that works well with both cold and hot water. As a result, it can get rid of chemical impurities such as rust, heavy metals and sediments that may be present in your water. AquaHomeGroup have ensured that anyone can install this shower head properly in just a few minutes and without any tools. Additionally, it is designed to fit with all standard shower types, including rainfall, wall-mounted and hand-held showers. Once installed, you should let water run through the Luxury Filtered Shower Head for 5-10 minutes before use. This will remove any carbon dust that had accumulated inside the filter. As the icing on the cake, this water filter comes in a fancy box and would make for such a chic and thoughtful gift. You will also notice a variety of different color shower caps as a bonus. AquaHomeGroup sure knows how to treat customers. The CraterAquaSystems 15-stage shower is an advanced inline filtered shower head designed to remove chlorine from your water and more. It comes installed with silver layer ions which are combined with KDF-55, calcium sulfite and active carbon to make the filtration process as efficient as possible. The KDF-55 in this system contains additional silver ceramic balls which help to break down pathogens found in your tap water. This high-performance water shower filtration system can effectively reduce over 98% of chlorine, thanks to its double chlorine protection design. It also removes other impurities such as bacteria, heavy metals, lead, iron and sediments. This system does not reduce the output pressure since it is designed to filter 10 liters of water per minute. This is the same flow regulation as most standard shower heads. The CraterAquaSystems filter is easy to install thanks to its standard ½-inch thread type that only requires to be screwed in place. You will not need any special tools or knowledge to set it up. Better yet, it comes compatible with all types of showerheads, including handheld shower systems, rain shower heads, inline faucets and standard faucets. This unit comes with two filter cartridges that are replaceable, hence giving you more shower time before you’d think of buying replacements. Comes with two backup filters. The 10-Stage Shower Filter from Captain Eco is a powerful water filtration system built to remove all unhealthy substances that may be in your water supply. It comes in a highly shiny chrome exterior that is rustproof and durable. Inside, it is equipped with a myriad of filter media which include activated carbon, KDF-55, Biocera ceramic balls, polypropylene cotton, calcium sulfite, and Maifan balls. The ceramic balls are for specifically removing heavy metals, and the polypropylene cotton filter increases the surface area for filtration by 3-8 times more than standard filters. With this device providing your showers, even your breathing will improve considerably. It removes bad odor and inhibits the growth of algae and fungi. The Captain Eco shower water filter is able to remove all sorts of impurities from both hot and cold water. These include chlorine, trihalomethanes (THMs), heavy metals and Volatile Organic Chemicals (VOCs). The filter is not designed to completely remove fluoride, but it helps reduce a good percentage of it from the water. According to Captain Eco, each filter cartridge from this filter is capable of cleaning up to 12,000 gallons of water, which roughly translates to 6-8 months of shower time. It comes with two extra cartridges to ensure customers get as much shower time as possible before they have to think of a replacement. The unit is fairly easy to install and comes with Teflon tape to prevent leakages. In case you do not like the product, the company offers a 120% money-back guarantee. That’s right, they will refund for the package, including shipping and offer you a 20% credit on their site. Comes with two extra filters. The Aquasana AQ-4105 shower filter is designed to focus on removing chlorine and other impurities from your water, for healthier hair, skin, nails and easier breathing. Apart from removing more than 87% chlorine, the KDF-55 (copper-zinc mixture) and activated carbon filtration systems also decrease chloramine and levels of other chemicals. These include VOCs such as pesticides and herbicides, mercury, lead, iron and hydrogen sulfide (which causes bad odor). The package includes a massaging handheld wand and extra filters supposed to last you up to six months. The 5-foot handheld wand makes it easy to clean kids and pets without it getting in the way. The can also be variably adjustable from “spray” to “massage” mode. The AQ-A105 shower filter is easy to install, maintain, and replace. All you need to is to simply attach it to your existing shower line. Remember to run the water through the filter until the water turns clear. It may be black during first use as it cycles out the carbon. There are shower filters specifically made to remove water contaminants that strip your skin of its natural oils, causing skin irritation and dryness. It keeps our bodies hydrated properly and allows the skin to naturally heal from disorders such as eczema and other skin conditions. The Aquabliss SF100 is a nifty filtration equipment that is crafted to neutralize odors, balance out pH levels and infuse beneficial minerals in your water. The minerals nourish your skin, nails and hair, making every shower look, smell and feel like pure spring water. The system combines multiple filtration stages, including KDF-55, calcium sulfite and activated carbon among others. As per the manufacturer, the 12-stage filtration system is able to neutralize odors and eliminate common water impurities such as chlorine, heavy metals, bacteria, herbicides and pesticides, in hot and cold water. The AquaBliss shower filter prevents the growth of algae, fungi and mold which can be a menace in some places. It is also fitted with a micro-porous polypropylene cotton layer which helps to get rid of sediment and dust. One huge advantage of the AquaBliss SF100 over other models is that besides decreasing a wide range of contaminants, it also infuses your water with minerals and vitamin C that are meant to revitalize brittle hair and nails as well as dry, itchy skin. The SF100 comes with a filtration capacity of 10,000 gallons which roughly translates to 6 months of showering. This is quite standard for water filters, meaning you will need little maintenance within a year. Installing the SF100 is one of easiest parts since it’s compatible with all standard shower heads. You should be done within a few of minutes without needing any tools. It comes with a sealing tape to prevent leaks and in case of any assistance, the Aquabliss customer service is especially helpful. Has infused vitamins and minerals. Naturally, low water pressure is the worst especially when in desperate need for a quick shower. Fortunately, there are high pressure shower head filters that not only remove impurities but also gives water a powerful flow for relaxing showers. Standing under a shower with low pressure can be very frustrating, but this can be fixed easily if you choose to get the Wassa High Pressure shower head. It comes with a 3-inch face containing 45 jets designed to specifically amplify your water pressure and maintain a consistent flow. It is a removable stainless-steel filter and the silicon jets prevent lime and hard water deposits from accumulating. Installing this device is a piece of cake, and you will not need any tools or instructions. It comes with standard the G1/2” thread which is easy to fit to any standard shower arm. All you have to do is unscrew the old shower head, screw on the new one and voila! You will also find a spool of plumbing tape in the package. Use this on the threads to ensure a water-tight connection. The Wassa High Pressure also spots a brass swivel ball joint which makes it easy to adjust the direction of the water spray. This way, you can shower however you like. In case you have any qualms with the product, the company offers a lifetime guarantee to all their showers, so do not be afraid to try this unit out. If you were looking for a shower head that can remove impurities and increase the water pressure as well, the Clearly Pure Filtered Shower Head from Barclay’s Buys will totally exceed your expectations. Unlike similar products in the market that are made in plastic only, this unit spots two metal rings fitted on each end of the shower head. This is a strong structural design that is built to last even when under high usage. To keep the pressure high, this shower head system uses a new laser cut micro-hole technology. The technology is able to save on water by cutting back water outflow, while still maintaining sufficient pressure. as a result, you can enjoy healthy and clean showers with minimal impact to the environment. As mentioned earlier, the Clearly Pure Shower Head comes with a filter already installed. It eliminates up to 80-90% of chlorine as well as reduce the amount of sediments drastically. It last 6-8 months, depending on your water usage and amounts of total dissolved solids in your water supply. It is super easy to install even if you know nothing about being handy. Simply screw it on and you are ready to change your wash life. Hard to regulate water pressure. A handheld shower filter removes chlorine and common water contaminants while adding functionality. They are flexible, making them ideal for kids and older people who need assistance. It ensures you get a shower stream to every part of your body and also makes it easy to wash pets. The Culligan HSH-C135 is a handheld shower head that comes in a chrome finish and is designed to reduce chlorine levels as well as scale in your water supply. It is fitted with an anti-clog rubber spray nozzle and a metal shower hose that enables you to invigorate those hard-to-reach muscles. For maximum comfort, you can choose from five spray settings which range from a relaxing muscle massage to a full-body coverage. Many users have claimed to feel the benefits of this shower after just a few uses. You will be glad to know that this shower head filter system comes in both wall-mounted and handheld models. The handheld model is very easy to install and requires no tools since it is made compatible with existing plumbing on a standard connection. You will find an ample amount of plumber’s tape inside to help you prevent any leaks. This shower head is certified to meet NSF standard 177 for filtered showerhead systems and comes with a WHR-140 filter cartridge. This type of cartridge is capable of filtering up to 10,000 gallons of water before a replacement is needed. Of course, depending on the initial condition of your water. Comes with five spray settings. Does not reduce TDS (total dissolved solids). The Luxsego shower head filter is a popular and budget-friendly model built to improve the quality of your water in two ways. First, it enriches you shower water with infrared and anion mineral beads. The minerals can be absorbed directly to your skin, making it more elastic. These minerals are also supposed to improve blood circulation delaying wrinkles for youthful and glowy skin. Secondly, this shower system removes impurities such as chlorine. Water free of chlorine restores the balance in the oil glands in your skin. This unit has a great design and is fitted with a showerhead that can provide three spray patterns, that is, rainfall, jetting and a massaging one. It also includes a metal penal that does a great job maintaining high water pressure. The high pressure can help you lower your shower water consumption by up to 30%. The filtering beads are prone to clogging. Inline shower filters let you enjoy filtered water without having to give up your existing shower head. They are an inexpensive filtration solution that easily attaches to your shower and effectively reduces water pollutants. The Culligan ISH-100 is an inline shower filter that removes all the damaging impurities commonly found in shower water. It comes in a chrome and white finished design that does is sleek, compact and durable. This shower head gets the job done in terms of removing impurities and will leave your shower water smelling fresh and clean. More importantly, your hair, skin and nails will also feel healthier. It uses a patented filter media which is able inhibit the passage and growth of bacteria for a better shower experience. It can reduce chlorine concentrations and odor by up to 97%, not to mention its ability to reduce sulfur odor as well as limescale build-up. You can rest assured that this unit works since it is tested and certified by NSF International against ANSI Standard 177. The filter can last for up to three months and is easily replaceable using new cartridges. It is compatible with all standard ½-inch shower arms and you will need no tools to set it up on your existing shower head. You will also find plumber’s tape for preventing leakages and stickers that remind you when it’s time to change the filter. The Sonaki Vitamin C inline filter comes as one of the best options for people seeking to improve the health of their hair, skin, nails as well as promote the quality of their shower. This is a great filter that uses Vitamin C to remove up to 99.9% of chlorine, chloramines and other toxins naturally. These impurities can prevent hair growth, cause hair loss, itchy skin, red eyes, just to name a few. This shower allows you to toggle between various setting such as the regular setting which is perfect for everyday showers. On the other hand, its massage setting targets sore muscles and helps you relax. The attached Vitamin C filters are built to clean up to 5000 liters (3,000 gallons) of water, which loosely translates to 3 months of use. This system requires a 3-step installation process – a little more complex to some models, but nothing you cannot do on your own. You also get a wrench for changing out the filters for free. Note that although this is a low-flow shower filter that consumes up to half as much water as standard shower heads, it still able to deliver enough pressure to help you get clean after a rough day. Here is a pro tip, when using this unit from Sonaki, make sure that the filter is positioned directly above the shower head. After a shower, you will notice that water remains in the filter, as well as some residual water in the chamber. To avoid this water from dissolving the vitamin C, rotate the filter to point the chamber downward and drain out all the water. This way, you can use your filter for longer before requiring a replacement. Good for skin, hair and nails. Does not drain completely when turned off. The Sonaki Vitamin C Inline Filter is able to remove 99.9% of chlorine and chloramines from your water supply thanks to its patented Vita C filter technology. Sonaki filtered water prevents dry and itchy skin normally caused by hypochlorous acid formed when chlorine dissolves in water. As a result, you will notice a softer skin and healthier hair after using this shower for a while. This in-line shower filter can clean up to 3000 gallons of water for the vitamin c filter while the separate PureMax filter can handle 20000 liters before replacement. Most users find the inline filter by Sunaki fairly easy to assemble and replace. Like most inline shower filters, you will require plumber’s tape and a pair of pliers for a solid job. First, you must remove your existing shower head to attach the shower filter. Screw on until secure and do not forget to use the provided Teflon tape to prevent any leakages. After that, you can return your old shower head back. Luckily, this filter is transparent to help you monitor and decide exactly when it needs to be replaced. And the best part, the system comes with two bonus filters, so do not worry about having to look for replacements soon. Comes with 2 bonus filters. The vitamin C filters don’t last long. Some have mentioned experienced leakages after a short while. The QwenchPure Inline Showerhead is an inexpensive yet wonderful water filter that works harder than expected. The moment you turn the shower on, you will experience the difference between pure and impure water thanks to its quality filtration. This filtration system uses 100% American made KDF-55 filter technology. It eliminates chemicals such as chlorine, fungi, algae, hydrogen sulfide besides softening hard water. As a result, you can expect your brittle hair to become more voluminous, and your skin to retain its natural moisture and glow. The amount you spend buying lotions and bathroom cleaners for removing scum is also bound to reduce. Most users report noticing a difference within just a few days of using this filter. The QwenchPure shower head filter is also capable of removing heavy metals, scale and inhibiting the growth of algae, blitz mold and fungus. It ensures there are no water stains on your beautiful tiles while using this shower. Installing this shower filter is quite easy, and you will not need any special tools. You will have to remove your old shower head, attach this to the water supply, then re-attach the shower head to the standard extension. Expect to lose no water pressure at all, and to maximize the full potential of this filter model, QwenchPure advises that you replace the filter every 5-7 months. Poor quality plastic mold fittings. The CasaFlow Shower Filter is a powerful overhead filtration unit that will fit naturally with most home decors. It removes over 99% of the chlorine in your water supply, not to mention bacteria, heavy metals and pesticides. People having issues with dry, damaged, and unmanageable hair and skin, have reported an improvement in their conditions within days. Activated carbon cannot remove chlorine in hot water. The CasaFlow filter uses KDF-55 and calcium sulfite, which are more effective at getting rid of chlorine, and other impurities. Moreover, it contains 180 grams of KDF, which is double the amount found in most showers. This filter is very easy to install and there will be no need for any tools. It is fitted with universal connections, which enable the unit to connect to all standard shower heads. Moreover, the universal valve can rotate 360º for best positioning. One notable feature in this shower filter is the long-lasting cartridge, which is capable of filtering up to 13,500 gallons of water for roughly six months. Even better, you won’t have to guess when it’s time to replace the shower thanks to CasaFlow shower filter’s in-built digital reminder. The Hotel Spa 7 Setting shower head filter is a handheld device that brings you the latest in showerhead style and performance. This luxurious shower system contains the latest shower water filtration technology that produces, clean and purified water. It comes with reversible KDF/Active Carbon Shower filters that deliver an amazing shower experience. The KDF (copper and zinc media) works with hot water and is known to help eliminate up to 99% of chlorine and its vapors from shower water. On the other hand, the active carbon removes impurities in cold water. Besides chlorine, the HotelSpa 7 water filter reduces exposure to radioactive iodine and radon as well as hydrogen sulfide which gives water bad odor. Furthermore, this shower is able to balance your water pH levels and you will not have to worry about the growth of mold, mildew and algae on your water supply. With such features, the quality of your showers is bound to improve drastically. As per the name, the HotelSpa includes 7 different shower settings, ranging from the Power Rain mode to the Pulsating Massage mode. The various options combined with the 4-inch chrome face ensure that the water pressure is strong enough to refresh your senses. But the fun does not stop here, the HotelSpa shower head filter comes with a 5-inch super flexible stainless-steel hose that gives you complete freedom to move around in your bathroom. To top it all, you can control everything like a boss using the 3-zone precision SpiralFlo click lever dial. This system connects in minutes to any standard overhead shower arm and you will need no tools or the services of a handy neighbor. You will also find enough plumbing tape to prevent any leakages. Comes with 7 different shower options. Settings are a little difficult to set with soapy hands. The whole unit is considerably large. If you want to soften your hard water as well as remove chlorine and fluoride from your water supply, then it’s time to get the Freshflow shower filter. Removing these impurities is crucial for those seeking to improve their hair and skin condition with an affordable solution that truly works. The whole filtration system relies on the efficient 12-stage filter cartridge water softener system which also removes most impurities, including iron from your water supply. This shower head also infuses vitamin C directly into the water, which helps maintain healthy nails, skin and hair. This shower is therefore ideal for those suffering from skin issues such as psoriasis and eczema. The Freshflow Water shower filter is made to attach easily to the standard size shower heads and piping. This makes it a breeze to install without any special tools. In case you are disappointed by the performance of this system, you can take advantage of the 30-days for a full refund policy. Comes with a replacement cartridge. Users have complained of leakages. Reduces the height of the existing showerhead. The PurRite 12-stage water filter is a nifty device intended to make showering more refreshing and enjoyable. It comes in a simple yet classic design and is easy for anyone to install even without any tools or experience. The PurRite shower filter instantly softens your hard water supply and is capable of eliminating heavy metals, odors, chlorine, bacteria, pesticides, sulfur, rust, and even sediments. As a result, that this shower has helps with itchy skin, dry scalp, eczema, flaky skin and brittle hair. Additionally, it incorporates vitamin C as well as minerals and oxygen into the water. This promotes the health of your skin dramatically. All these is possible due to the high-tech filtration element inside such as; Vitamin C, calcium sulfite, KDF-55 and Nano silver which breaks down bacteria. All these filters and others are combined scientifically in varying amounts to provide efficient water purification that promotes general health. To installing this shower head in your bathroom, you will need no tools. The whole process is easy enough for any adult to accomplish and thankfully, the fittings are designed to be compatible to all types of shower heads (Including rain, fixed or handheld). Compatible with standard shower heads. Reduces 99% of scale, sulfur, and chlorine. Vitamin C shower head filters have tubes of Vitamin C that neutralizes water and removes chlorine. Most Vitamin C shower head filters remove at least 93% chlorine and trace amounts of other contaminants such as sediment and rust. The SITAFL 15-stage filtration system is a powerful shower head that guarantees more efficient elimination of all kinds of impurities from your water supply. Its filtration formula is designed to offer protection to your hair, skin and nails from the daily damage caused by hard water. The 15-stage filtration system which include KDF 55 elements is one of the most innovative in the market. as a result, no scale deposits, dirt, bacteria, pesticide, heavy metals, chlorine, fluoride and or organic materials will get through to your skin. The system uses magnetic energy balls to infuse the water with more oxygen which helps in nourishing your hair and skin, besides providing for a more refreshing shower. It also releases vitamin C into your shower water to help nourish, moisturize and make the skin look younger. The vitamin C is specifically for neutralizing the chloramine and chlorine in the hard water. What truly sets the SITAFL 15 Stage water filter apart all the others, is its Maifan stone layer. This layer of medical stone can remove impurities and restores the skin’s pH levels back to normal. You will find the system ridiculously easy to install using the screw-in mechanism. For your convenience, the package includes Teflon tape, 2 extra filter cartridges and any necessary items needed for you to start enjoying your showers. Improves the quality of water. Is effective in removing chlorine as other models. The Pure Action Vitamin C is a full-metal shower head filter specifically designed for children. It is made to remove chlorine and turn hard water soft so that the soft skin of your baby remains healthy. This filter is fitted with an internal filter cartridge that infuses Vitamin C directly into the water. This filter is made to eliminate a wide range of impurities that normally lead to dry skin and unhealthy hair. These include chlorine, fluoride, heavy metals, chloramine, bacteria, pesticides, herbicides, the bad odors of ammonia and sulfur as well as sediments. Besides vitamin C, this shower filtration system uses a universal mineral blend of Seoul stone balls, tourmaline and negative ion balls for a spa-like shower experience. It ensures your shower water will maintain healthy pH levels and always have a refreshing citrus smell that invigorates the senses and reduces stress. The cartridge in this filter will last about 6 to 8 months. This is roughly 10, 000 gallons of clean water per filter. After it is done, you can make a replacement starting with the bonus filter that comes with the package. This means an extra 6 to 8 months of shower time after buying the PureAction shower. The PureAction shower filter connects to all standard ½-inch shower arms without the need for any tools. These include wall-mounted, rainfall and fixed showers. Be sure to use the included Teflon tape to prevent any leakages from the unit. Before going out to buy yourself a new shower head filtration system, there are numerous details that you need to be aware of. These will help you increase the chances of finding the perfect fit for you. What is the current condition of your water? One of the most important things to consider before buying a shower head filter is the current condition of the water running in your taps. This will be different from person to person, depending on your location and a simple water test can be done at home. The point is to have a rough idea of the impurities in your water supply so you can buy a shower filter with a matching filtration system. For instance, say your water has high levels of heavy metals and trace amounts of chlorine. In such a case, buying a filter designed to remove mostly chlorine may not produce the results you were hoping for. What does your old shower head look like? You will want to consider the current condition of your shower head, both in terms of design and aesthetics. Most shower head filters are built to be compatible with standard 1/2 -inch shower heads and pipes. However, confirm the size of your pipes as well as the height of your shower head. Know that most water filters tend to push the shower head lower by a couple of inches. Lastly, make sure that the water pressure is going to remain comfortable for your needs. If your shower head is already as low as it can get, consider a water filter that can be mounted on top. You can also opt for a filter and showerhead combination that does not eat into your shower’s height. There are water filters that can increase your water pressure. In the same breath, some are designed to reduce the rate of flow while some do not interfere. Depending on your current water pressure, you can pick a filter that will suit you best. If you have children and pets, having a handheld shower filter can dramatically improve the quality of their showers and reduce the effort on your part. Look for models that provide long and flexible cords that will not get in the way. Some models have elastic cords that can stretch that can go from 5 to 7 feet when needed. If you can calculate how many showers you take in a year or 6 months, then you will have an easy time approximating how long your filter will last. If you are a family that uses a lot of water, look for a model that filters more gallons before getting depleted. Some models offer bonus filter cartridges. Most shower filters come with a sticker that reminds you when it’s time for a replacement. Some modern models have an in-built display that lets you know when to make the change. Alternatively, note that most filters tend to drop the water pressure when they get depleted. So, if you notice that your pressure is getting low, that may be your cue to change the filter. At first glance, choosing the right water filter may seem overwhelming. The available options are pretty much endless and specific needs and wants easily get drowned in the sea of product features and promises. However, knowing all the features you want to be included in your shower filter and what to expect after installing it makes the whole thing easy, even fun. The models listed in this review are some of the best in their various categories and choosing anyone of them will surely serve you well. How To Find Your Best Shower Head Water Filter?